This intriguing study of Mexico's participation in world's fairs from 1889 to 1929 explores Mexico's self-presentation at these fairs as a reflection of the country's drive toward nationalization and a modernized image. Mauricio Tenorio-Trillo contrasts Mexico's presence at the 1889 Paris fair—where its display was the largest and most expensive Mexico has ever mounted—with Mexico's presence after the 1910 Mexican Revolution at fairs in Rio de Janeiro in 1922 and Seville in 1929. Rather than seeing the revolution as a sharp break, Tenorio-Trillo points to important continuities between the pre- and post-revolution periods. He also discusses how, internationally, the character of world's fairs was radically transformed during this time, from the Eiffel Tower prototype, encapsulating a wondrous symbolic universe, to the Disneyland model of commodified entertainment. 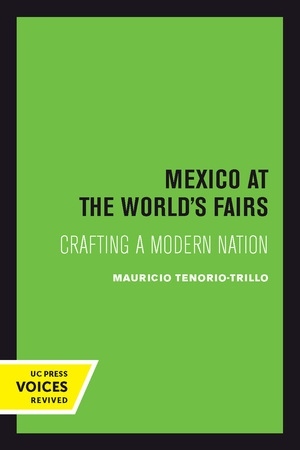 Drawing on cultural, intellectual, urban, literary, social, and art histories, Tenorio-Trillo's thorough and imaginative study presents a broad cultural history of Mexico from 1880 to 1930, set within the context of the origins of Western nationalism, cosmopolitanism, and modernism. This title is part of UC Press's Voices Revived program, which commemorates University of California Press’s mission to seek out and cultivate the brightest minds and give them voice, reach, and impact. Drawing on a backlist dating to 1893, Voices Revived makes high-quality, peer-reviewed scholarship accessible once again using print-on-demand technology. This title was originally published in 1997. Mauricio Tenorio-Trillo is Associate Professor of History at the University of Texas at Austin.